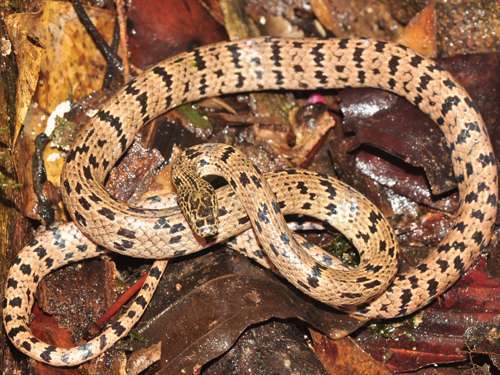 A distinctively patterned wolf snake is the latest species to be discovered in Cambodia's diverse Cardamom Mountains. The new snake has been named Lycodon zoosvictoriae in honour of the Zoological Parks and Gardens Board of Victoria, which has supported Fauna & Flora International's (FFI) studies in the region for several years. The peculiar almost chequered colouration of the snake renders Lycodon zoosvictoriae highly distinct and allows it to be recognised from other wolf snakes, so named due to their large teeth in both jaws. 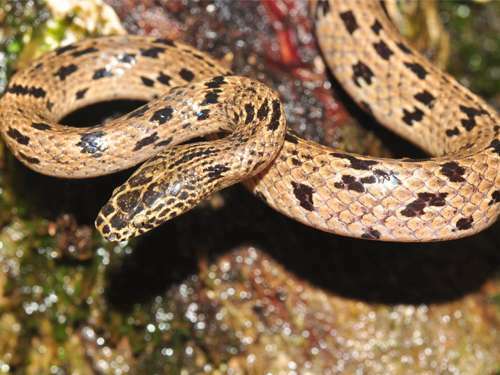 Scientists believe living in high altitude montane rainforest and a unique colouration has helped the snake remain overlooked, despite concerted survey efforts in the area. Cambodian herpetologist Neang Thy, FFI's research adviser in Phnom Penh, who both discovered and described the new species said, "Given its unique colouration, submontane habitat and altitudinal separation from other wolf snakes in the region, the species will probably prove to be endemic to the Cardamom Mountains." Thy was also responsible for naming the snake, adding, "The support FFI received from Zoos Victoria has helped build the capacity of Cambodian researchers and conservationists and has greatly improved understanding of Cambodia's reptiles and amphibians. "Naming this species in honour of Zoos Victoria will ensure a memorable and historical record of the support they've given FFI, both in discoveries and conservation of the Cardamoms," Thy added. Chris Banks, Manager of International Conservation Partnerships with Zoos Victoria said, "We are delighted to have a species named after us, and humbled to have our support for FFI's Cambodian programme acknowledged in this way." This discovery is the eighth new snake to be found in the Cardamom Mountains since survey work began in 2000, and once again shows how much remains to be discovered in this region of Cambodia.